THE STIEFF COMPANY, S. Kirk & Son and Schofield all cease to exist as companies. 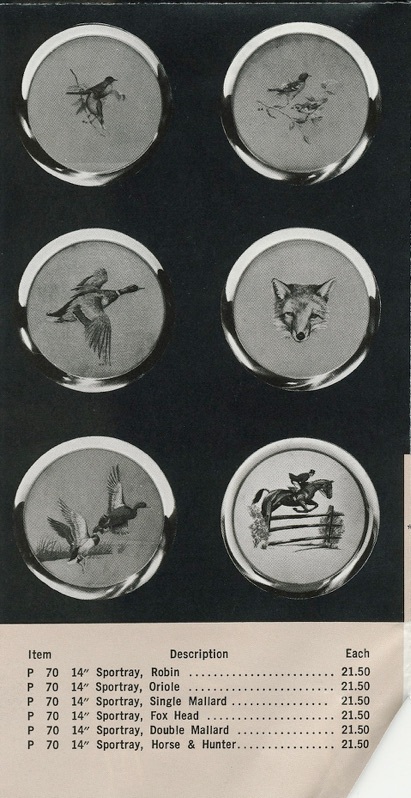 This site is published and curated by a lover of Baltimore Silver and Stieff Silver in particular. 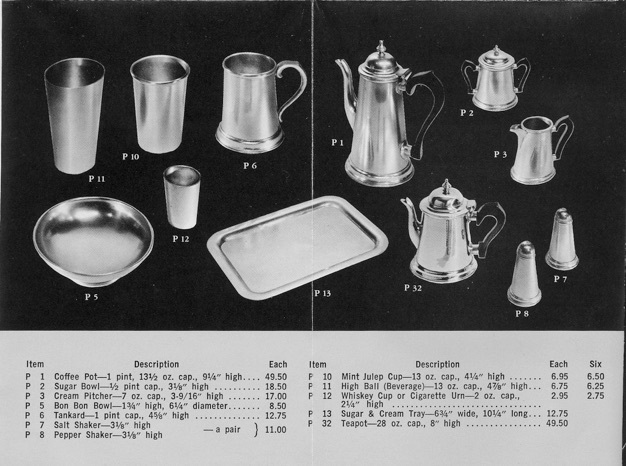 and those looking for better information on silver when preparing to sell on sites like Ebay and Ruby Lane, etc. If you find this site helpful, please consider making a donation to the site using Paypal.  I use the donations to purchase additional materials for the site. 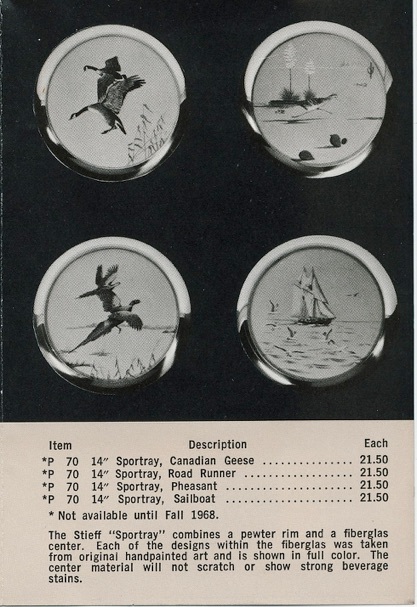 Some Stieff Pewter pieces will have an ATC markings like these. 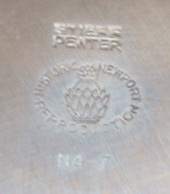 The ATC mark was the mark of the American Pewter Guild. 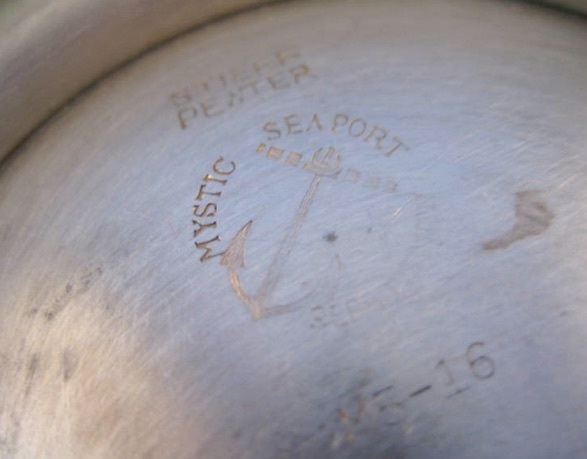 This mark is similar to having Sterling on fine silver. This standard would change in a few years to 92% Tin, 6% Antimony and 2% Copper. editing some material in the interior. Glue and tape marks remain from a Stieff family scrapbook. Due to the open size, I have scanned this in segments as presented in the original. The shorter pieces are part of the fold-over portion. 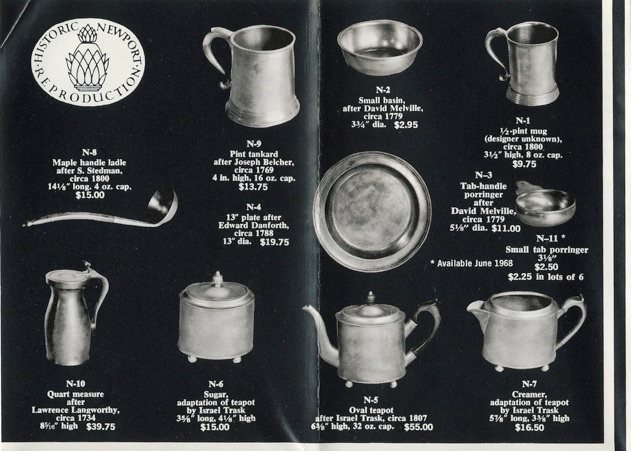 As the price of silver started to have great fluctuation and start to wane in popularity, Stieff looked for other ways to shape metal and create profit. In the 1950’s and early 1960’s american home fashion was both embracing the modern style and looking back to a resurgence of Colonial Decor. 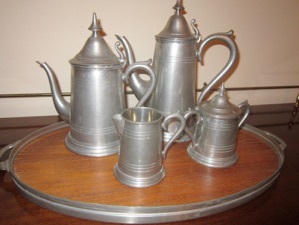 Pewter had been a great part of life in colonial america and it’s popularity was growing. 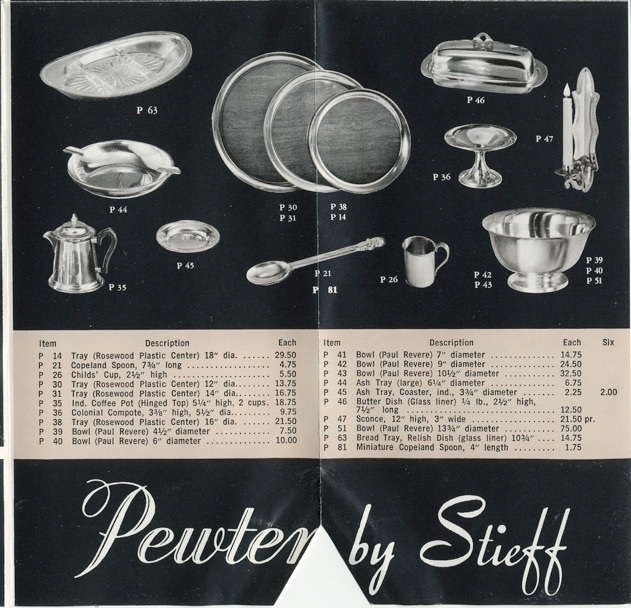 Stieff’s venture into pewter was whole hearted. Dozens of styles started coming out of the Stieff workrooms. 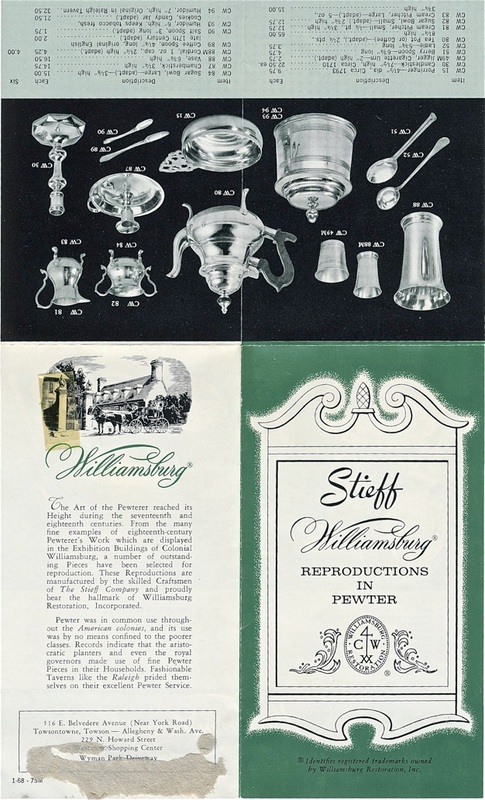 Colonial Williamsburg asked Stieff to create a line of pewter products that would be recreations of colonial items. Other historic association relationships would soon follow. 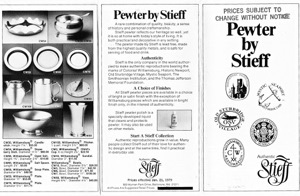 In 1970 Stieff more than doubled the size of the Stieff Factory in order to increase production of pewter. 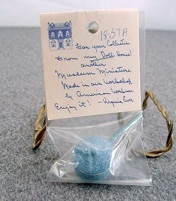 Stieff also bought the doll house miniature company COLONIAL CRAFTSMEN in Cape May NJ. At the bottom of the page is a link to information on that business. 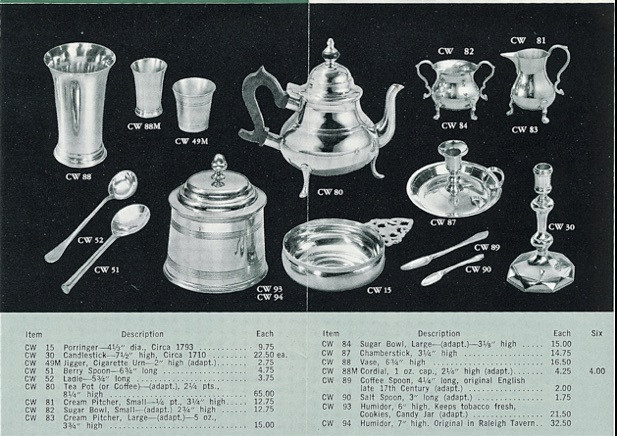 Of the items shown here, the most important is the early 1960’s Dealer Pewter Catalog and Price List. 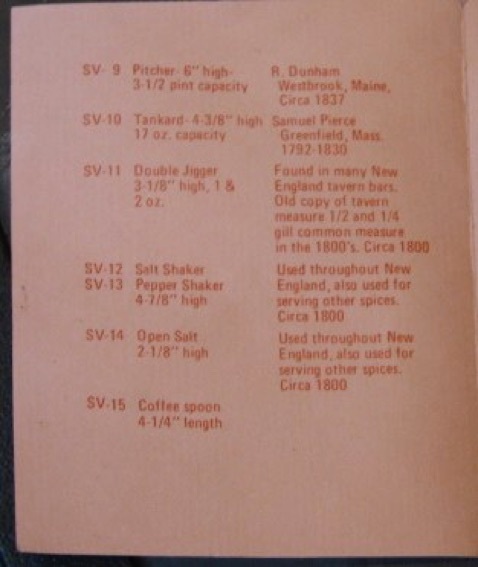 It gives a snapshot of the companies products and pricing in 1965. Photos in the book are as early as 1961 and go through spring 1965. NFL items are in the rear of the book. 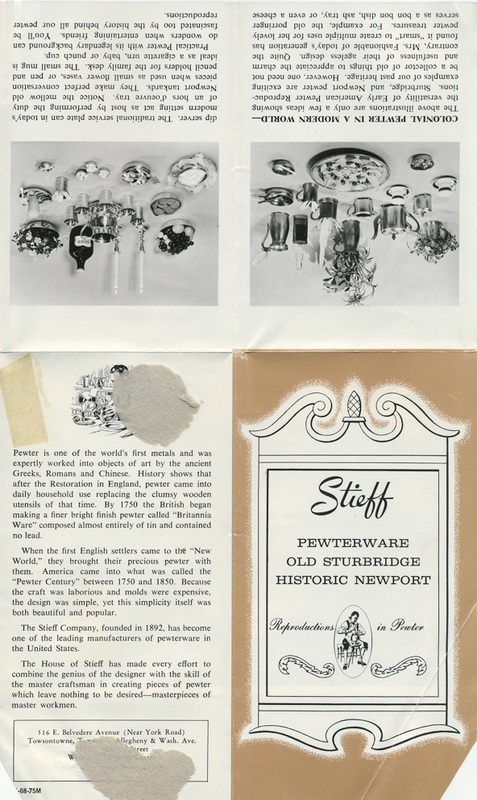 Below there are pamphlets on the various Stieff lines, plus the historic associations that Stieff made pewter for. please refer to that section. PRICE LIST section of this site. can be found at the bottom of this page. 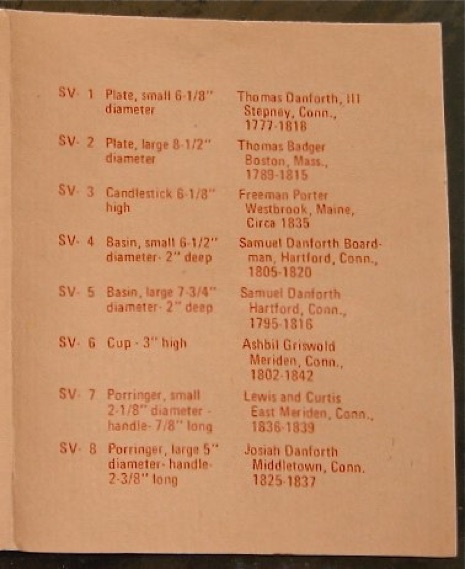 This pamphlet is 3 5/16th by 6 1/4 inches closed and scanned it in the original colors. 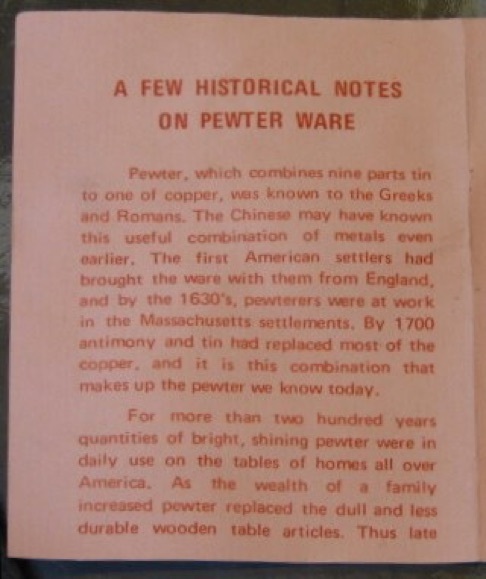 As more pewter pamphlets and books become available to us, they too will be scanned and published on this site. If you have any to loan, please contact me. 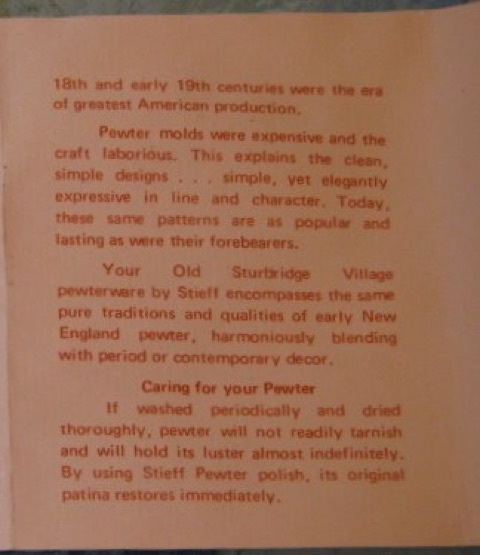 Precision Woodcrafts, the company that made the wooden handles for Stieff pewter and silver can still make replacement handles for your Stieff & Kirk Stieff items. So you do not have to turn upside down, here is the top section reversed. 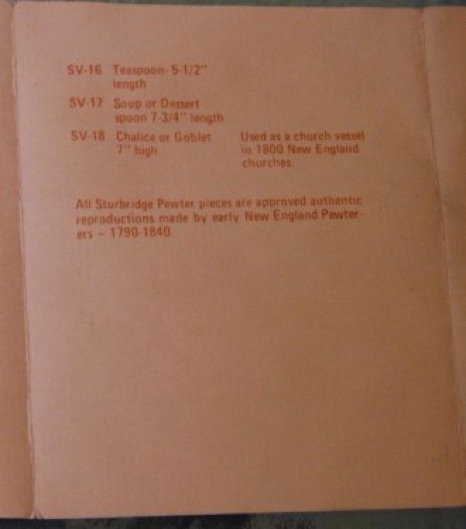 This pamphlet is 3 1/8 x 5 1/2 inches closed, and scanned in the original colors. This site, THESTIEFFCOMPANY.COM receives no money or compensation from any of the references or companies listed on this site. We wish to thank others for the use of material from their sites and it is published here as an educational tool only. Some images have come from unknown original sources. If I have used your image without credit or if it needs to be removed, please contact me. 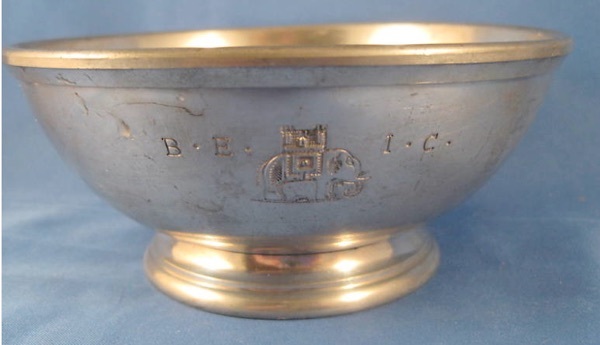 We encourage visitors to venture to the other sites shown on this one to learn more about silver and view the images of craftsmanship that they share with all of us. Ad revenues from the google ads helps me maintain this site for the use by silver collectors and those who are just “wondering” about their grandmothers silver and what’s what in the silver chest. I do not make a profit from the publication of this site, it is for educational purposes only. PRODUCING THIS SITE IS COSTLY. 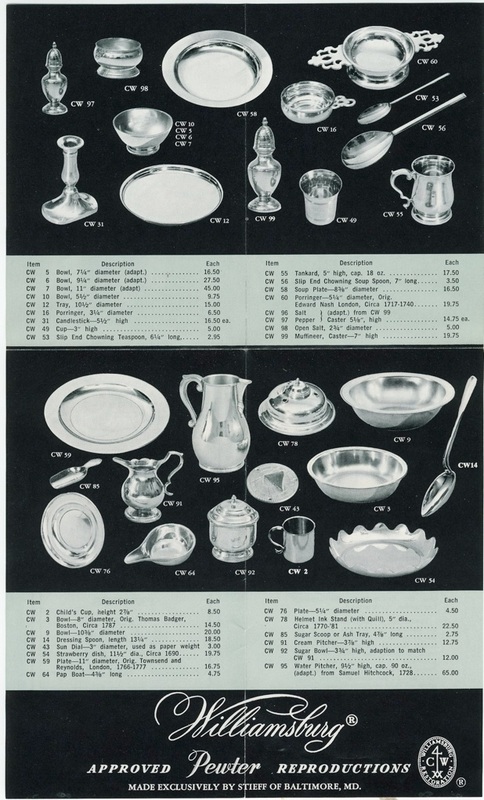 IT TAKES A LOT OF TIME AND TO BE HONEST... MONEY, TO HOST THE SITE AND TO BUY THE CATALOGS, PAMPHLETS, PRICE LISTS AND MORE THAT ARE REPRODUCED HERE AS AN EDUCATIONAL TOOL. I DO NOT CHARGE ANYONE FOR THE SITE. ABOUT A DOZEN EMAILS A WEEK COME IN ASKING FOR HELP IDENTIFYING A PARTICULAR PATTERN OR IN AREAS WHERE ADDITIONAL INFORMATION IS NEEDED. 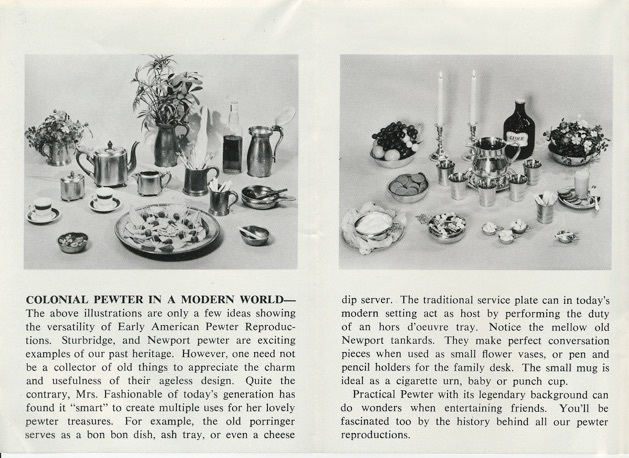 I HAVE A LOT OF OTHER MATERIALS THAT ARE NOT YET PUBLISHED THAT I CAN GO TO FIND THE ANSWERS ABOUT READERS SILVER OR PEWTER. AGAIN, THIS CAN TAKE A LOT OF TIME... BUT I DO NOT CHARGE FOR THIS SERVICE. YOU WILL NOT FIND ANY OTHER SITE OUT THERE LIKE THIS ONE... FOR ANY OTHER BRAND OF SILVER. 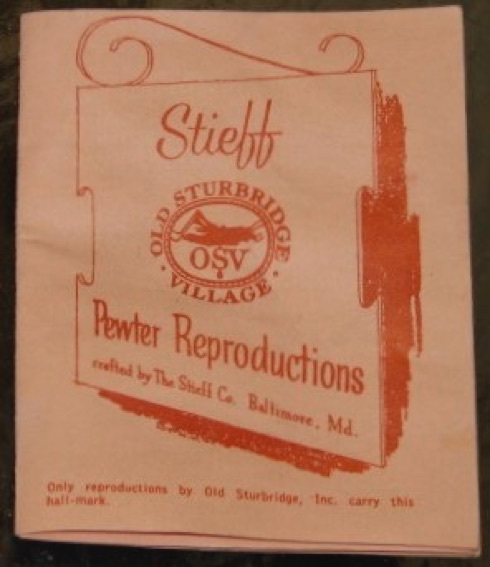 THIS SITE HONORS THE MEN AND WOMEN THAT WORKED AT STIEFF... EITHER AS CLERKS, SILVERSMITHS, DESIGNERS OR WAREHOUSE PEOPLE. 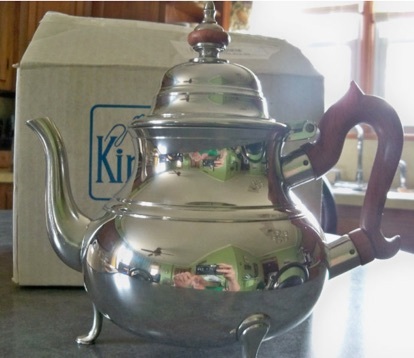 THEY ALL ADDED TO THE VALUE AND QUALITY OF THE SILVER AND PEWTER. YOU CAN HELP ME DEFRAY THE COST OF PRODUCING THIS SITE WITH A SMALL CONTRIBUTION. PLEASE, FEEL FREE TO ADD TO MY PAYPAL ACCOUNT TO SHOW YOUR SUPPORT. 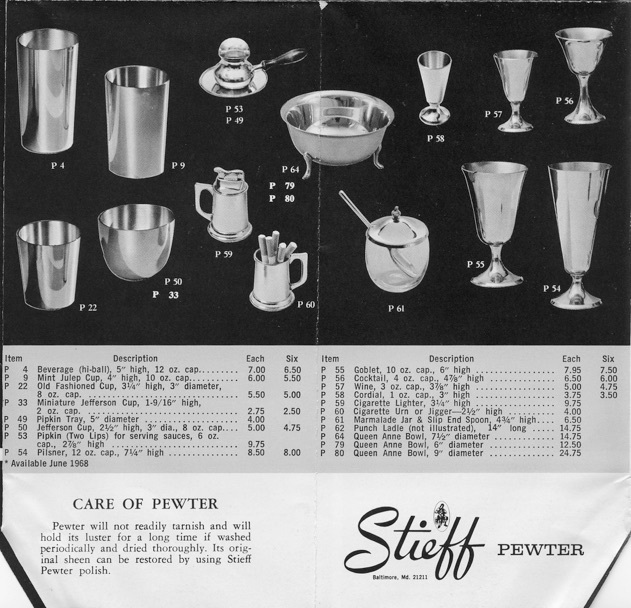 In the late 1960’s, The Stieff Company could not keep up with the demand for pewter. A new 18,000 sqr. ft. state of the art factory was in the plans and would open in 1970. But what to do in the mean time. 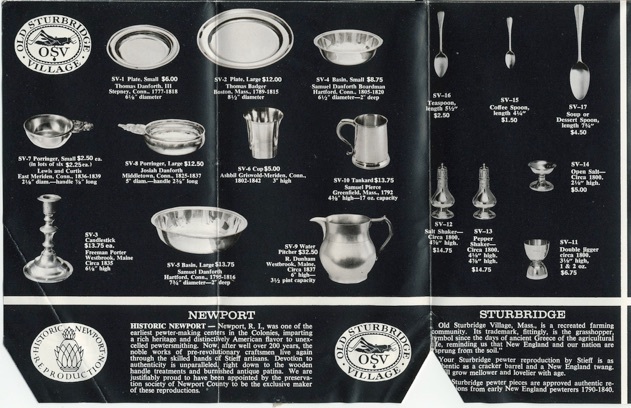 Jim Stieff was a young teenager at the time and recalls his father bringing home for dinner, representatives from from a spanish pewter maker. 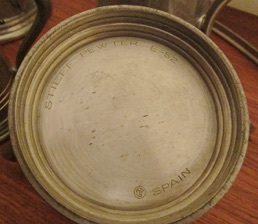 That company would produce pewter products in Spain for Stieff. The agreement ended when the new factory opened. The name of the spanish company is forgotten. The pieces are clearly marked SPAIN, and the model numbers all start with E, instead of the usual P. Above are examples of that foreign venture.